Pedro (Pete) Salas Rocha, age 96, and a resident of the William R. Courtney Texas State Veterans Home in Temple, Texas, passed away to be with the Lord on October 31, 2018. Pete was born in Kenedy, Texas on July 28, 1922. His father and mother were Pedro Garcia Rocha and Herlinda Salas Rocha, both deceased. He lived his youth and adult life in Corpus Christi, Texas. In 1942, Pete joined the U.S. Navy and served his country in World War II as a Petty Officer 1st Class in the Asiatic-Pacific war theater. 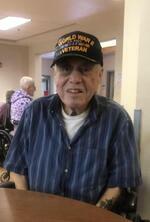 In his service he experienced combat action in the Leyte Gulf, Philippines and Okinawa campaigns of the war. He was honorably discharged in 1945 after war victory, when he then worked as a civil service supply clerk with the federal government at U.S. Naval Station Corpus Christi until he retired in the mid 1980’s. In the latter seven years of his life, Pete resided in Temple, Texas, first at a senior assisted living facility and later at the State veterans home. Pete has five siblings that include brother Rudolfo Rocha of Pensacola Florida, Edineo Rocha (deceased), sister Fela Flores (deceased), sister Patsy Hinojosa (deceased) and sister Corinne Villareal (deceased). He was previously married to Bertha Martinez Rocha of Houston, Texas and is survived by three sons, Alan Rodney Rocha (wife Robyn) of Houston, Texas; Dennis Dale Rocha (wife Diane) of Austin, Texas; and Paul Anthony Rocha (wife Cindy) of Temple, Texas. Pete also has four grandchildren and two great grandchildren. Funeral and memorial services with military honor guard will be scheduled at the Texas State Veterans Cemetery, 11463 State Highway 195, Killeen, Texas 76542, Friday, November 9, 12:00 P.M. All family and friends are invited to attend. This obituary is protected by copyright by Hewett - Arney Funeral Home. Proudly Serving the Communities of Temple, Belton, Troy, Rogers, Little River, Academy, Heidenheimer, Holland, Killeen, Harker Heights, Rosebud, Westphalia, Lott, Salado, and Fort Hood. Hewett - Arney Funeral Home is located in the state of Texas, United States.